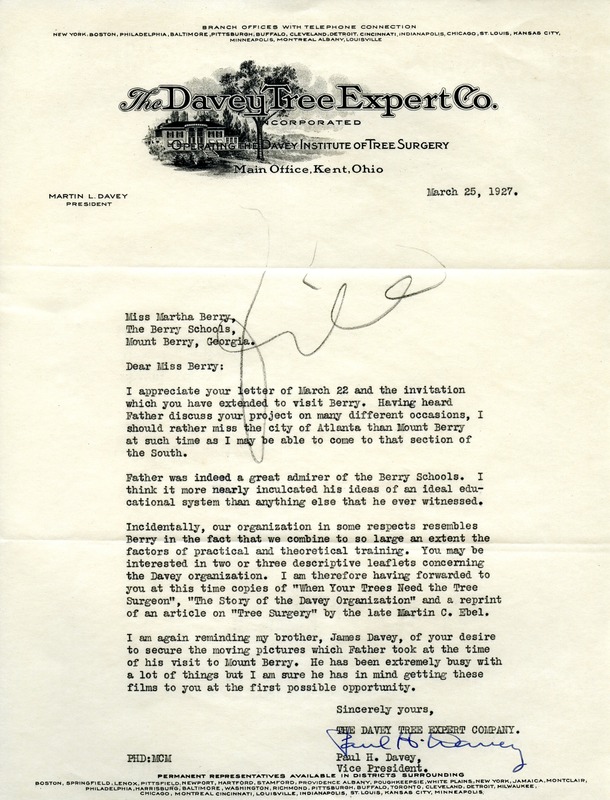 Letter written to Martha Berry, thanking her for her invitation to visit Berry. Compares Berry to his own company and also forwards information about his company with this letter. Berry School Film, invitation to visit Berry, The Davey Tree Expert Co.
Mr. Paul H Davey, “Letter to Miss Martha Berry from Paul H. Davey.” Martha Berry Digital Archive. Eds. Schlitz, Stephanie A., Elizabeth Zavodny, et al. Mount Berry: Berry College, 2012. accessed April 22, 2019, https://mbda.berry.edu/items/show/4071.